Use this guide to set up a traditional mini for printing. Read our traditional printing guide for essential information before designing your newspaper, and the glossary for an explanation of any unfamiliar words. Set up your document to the size of one page - width 180mm x height 260mm. Add 5mm bleed to the top, bottom and outside edge of each page. 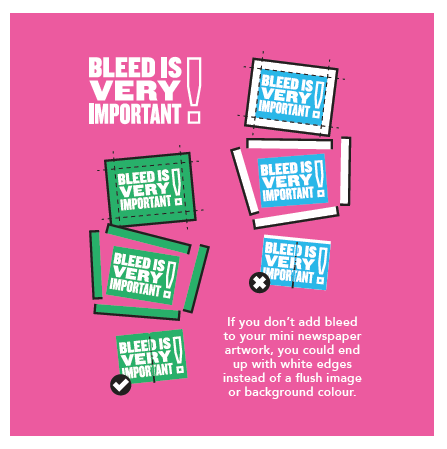 Your document size including bleed should be width 185mm x height 270mm. Don’t add bleed to the inside edge of your pages. Trimming isn’t exact, so we have defined a safe area, where you can place artwork and be sure that it won’t be trimmed. The safe area starts 10mm from the trim line, at the top, bottom and outside edge of each page. Minimum 16 pages, maximum 64 pages. Pages must be in multiples of 8. Make sure any backgrounds that you want to go to the edge of the page, completely fill the bleed, to avoid white lines around the edge of your artwork. Avoid having straight lines running parallel to the trim line, as these can enhance any wonky trimming. Anything outside the safe area may be trimmed. Export your PDF as single pages, in reading order, with 5mm bleed added to the top, bottom and outside edge of each page and no crop marks.